Excessive mold and mildew around the house can not only affect the look and feel of your home but also pose a risk to your health and wellness. The chances of mold developing increase when you have moisture or humidity in your house. This risk is greater when you are dealing with flooding or storm surges. Even if you manage to get rid of the water, there will be some residue of dampness and moisture afterward. Luckily for you, eliminating mold and mildew from your home is not difficult, thanks to modern mold removal products. However, selecting the best mold remover for your home can prove difficult, thanks to a large number of products available on the market. Every product claims to be the best, and you might have a hard time comparing options to select the best one for your needs. The right product for you would be one that not only gets rid of the existing mold but also prevents it from re-growing in the future. As you would know, there is a risk that mold and mildew reemerge after you clean them out once. This part is where the Mold Monster can prove the perfect solution for your situation. 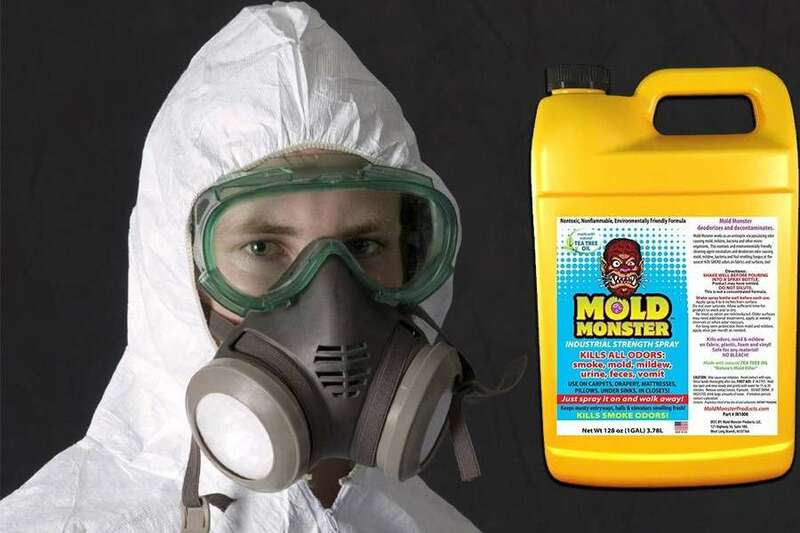 Mold Monster, the company, designed this product focusing primarily on the needs of homeowners in the aftermath of flooding or storm surges. ​Commercial Strength Mold Remover: This mold remover is the perfect choice for you if you have excessive mold and mildew in your home. In this situation, you need a strong product, and thankfully, the Mold Monster is a commercial strength product. This product can help you get rid of not just the mold, but also the odor that accompanies the water damage. You can use it for cleaning up mold from your home, but it is equally suitable for your office, or for a hotel or real estate property. ​Molecular Breakdown: This product helps you prevent the mold from re-growing when you get rid of it, thanks to its composition. The ingredients of the mold remover break down the mold and mildew at a molecular level. This effect creates a barrier that ensures that the mold has no way to re-grow. 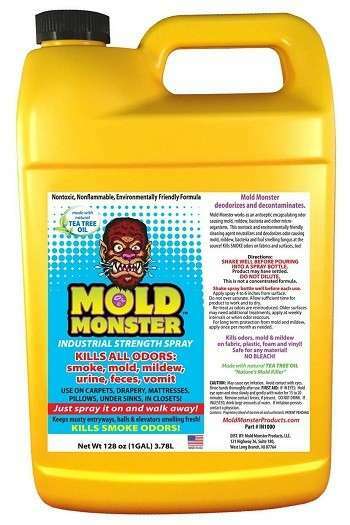 ​Secret Ingredient: The Mold Monster is a unique mold removal product as it contains a secret ingredient. The mystery ingredient is tea tree oil, which is all natural. In fact, all the materials the company uses for making this product are natural. This feature ensures that you don’t face the risk of chemicals or toxic elements affecting your health. However, the product is still strong enough to get rid of mold and mildew at first contact. Safe Product: As mentioned, this product is safe to use. The product comprises only natural ingredients. This product is non-toxic and does not contain any bleach. The environmentally friendly nature of this mold remover ensures no risk to your health when you get rid of stubborn mold and mildew. The product is biodegradable as well in addition to being non-allergenic. ​Moreover, Mold Monster manufactures this product in the US, ensuring high quality and this reason is why the mold remover is highly effective. A majority of the customers who purchased this product from Amazon are happy with its performance. There are few negative reviews, with only one customer complaining about the quality of the Mold Monster. A customer stated that the product didn't work and did not get rid of mold. However, the remaining reviews are hugely positive, with many of the customers recommending it for others. A customer wrote that the product is highly effective and not only gets rid of the mold but also the unpleasant odor that accompanies the mold and mildew. Another customer wrote that he used the product in the aftermath of flooding in his home. The washing machine overflowed when no one was home, and the family was left dealing with mold. The Mold Monster enabled them to get rid of the mold, and there was no unpleasant smell either. A customer wrote that her home was affected by a hurricane in Texas. She used the Mold Monster to get rid of the mold and mildew, and the product made the process easier for her. A customer wrote that she used this product to get rid of mold from the Church where she works. Another reviewer mentioned that her parents’ basement floods from time to time, leading to mold. She uses the Mold Monster to restore the basement to its pristine condition, ensuring there is no risk of the mold re-growing and also getting rid of the nasty smell. You can conveniently purchase this product on Amazon. The Mold Monster is currently available for around $70, and you can also avail free shipping, depending on the seller you choose. You can place the order from the comfort of your home, and they will deliver it to your doorstep, which means no hassle for you. 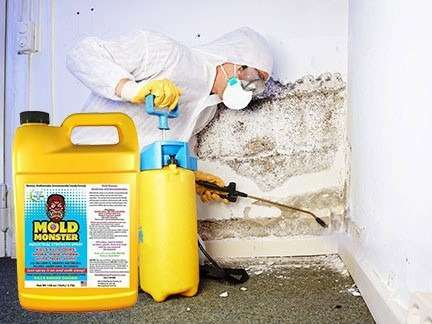 Overall, there are no drawbacks to opting for the Mold Monster for getting rid of mold and mildew from your home, office, or any other space. The product is strong and will not only help you remove mold but also prevent it in the future.